Sup guys! How are things treating you in the new year? For me it's the typical case of, I can't believe is going so fast! January just went by in flash before I knew it. That's exactly how I ended up breaking my nice string of monthly posts that I had started. I suppose that is alright since this post is a disruption anyways. 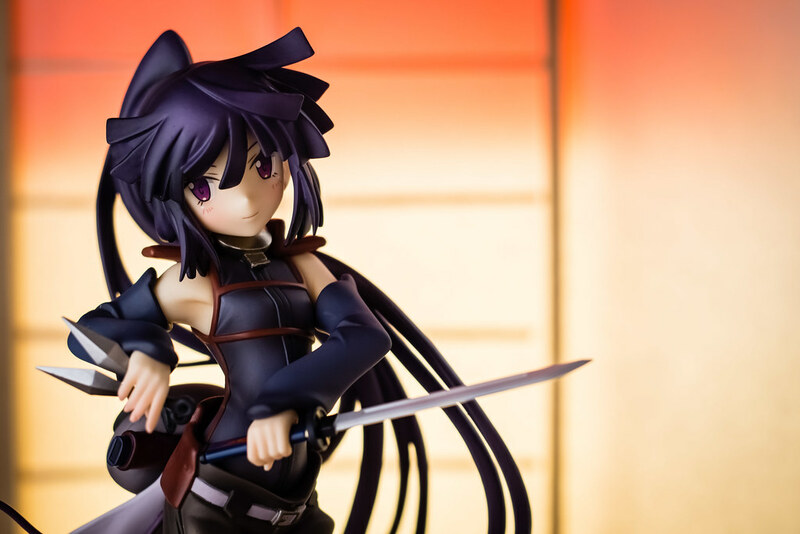 As you can see this time we are taking a look at the cute and tough Akatsuki from the novels and anime Log Horizon from Aquamarine. 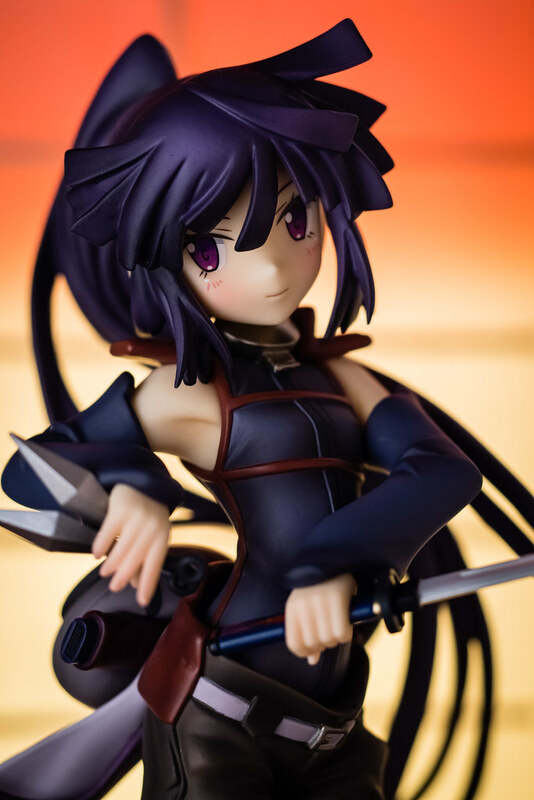 Akatsuki was the last scaled figure that I received during last year, quite a nice year for me in terms of releases. 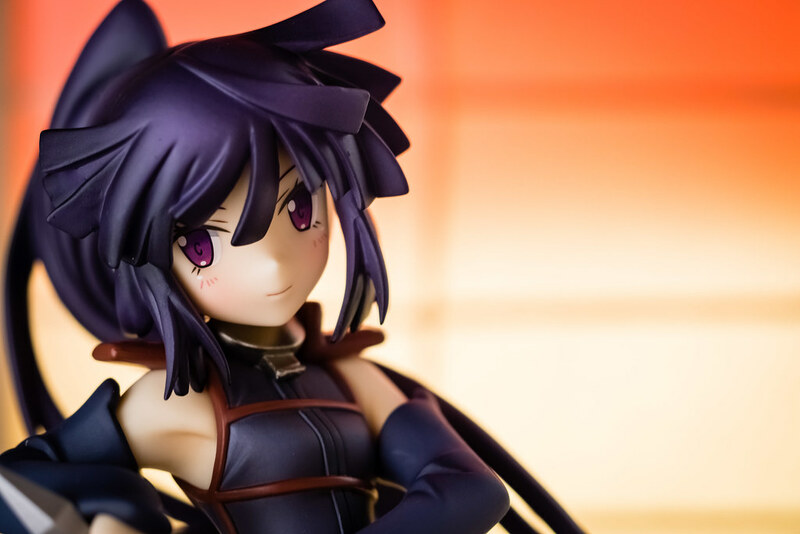 Even though she was the last, she takes the title as the most memorable figure of the year for me. 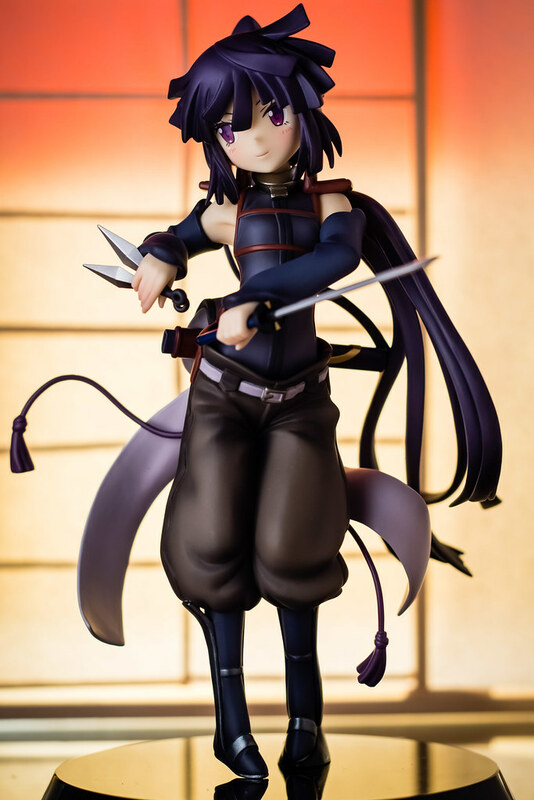 Out of all the characters I could think would be getting a figure, out of all the shows I could think, not once did Akatsuki or Log Horizon cross my mind. 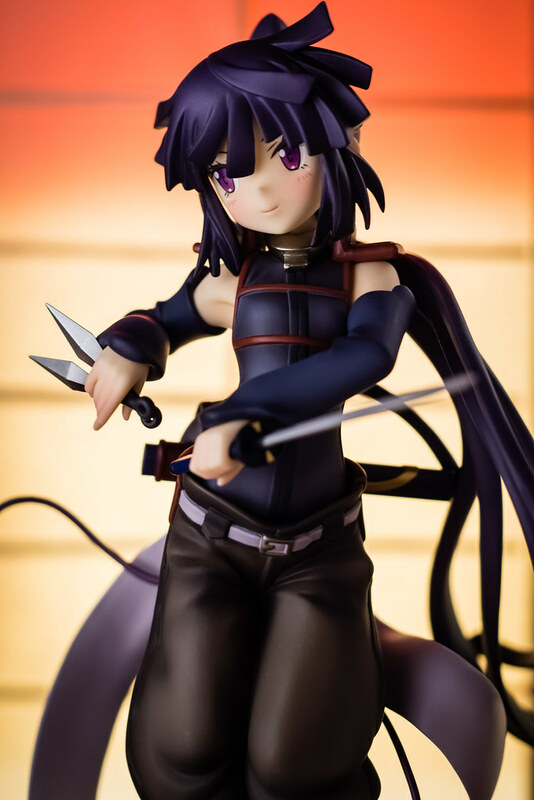 When the only surprises I get nowadays are the higher and higher prices for figures, Akatsuki was a breath of fresh air. I'm hoping this year will full of surprises like this! 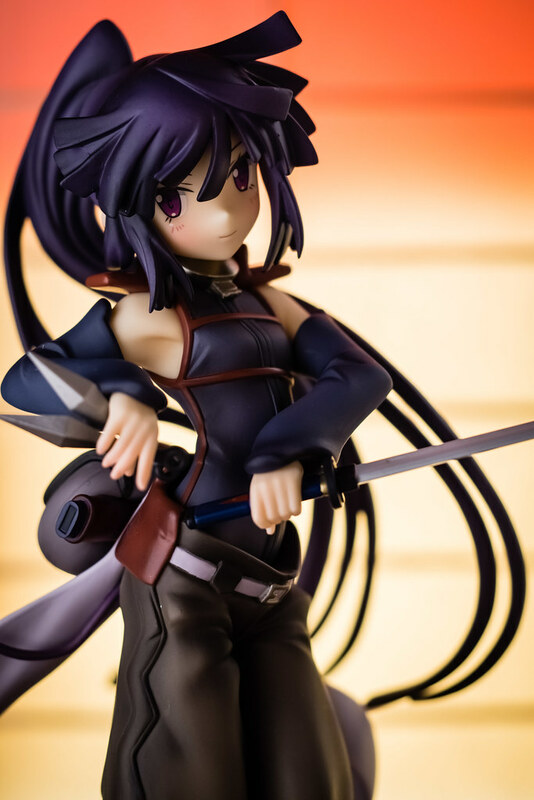 Since I received Akatsuki I got thinking about Log Horizon, specifically about the author, Mamare Touno. Last year he ran into some trouble with the Japanese government due to some unpaid taxes. Usually from what I've seen when Japanese creators get into trouble it spells doom and gloom for their works. As far as I know he paid his owed taxes and apologized to his fans for the whole ordeal. I'm hoping that this didn't cause any issues his publishing arrangements, I would really like a conclusion to Log Horizon after all! I mean, I have become hooked after having watched the two seasons of the anime and quickly became my favorite "trapped in a game" show. I was actually quite late to the party when it comes to Log Horizon and watched the first season quite a bit after it aired. At the time I was quite burned out on the concept of players become mysteriously trapped in an MMO. Having just watched SAO and being terribly disappointed by its second half I was not in the mood to try another show with a similar premise. The latest show from .hack was a bit of a miss with me being mostly about nothing with characters I didn't care about. I always liked the concept though, I did enjoy playing through the seven .hack games on the PS2 after all. Luckily for me, I attended a local anime screening gathering where they happened to show a few of the early episodes of Log Horizon. I became hooked on what I watched. When I got home I desperately needed to know what Shiroe was planning. I needed to know how selling burgers was part of his master plan for Akiba or else I wouldn't be able to sleep at night! So I started the show properly from the beginning and blew through it in a few days. I couldn't wait for the recently announced second season at the time after I was done watching it. The second season continued to deliver for me, I was a fan. 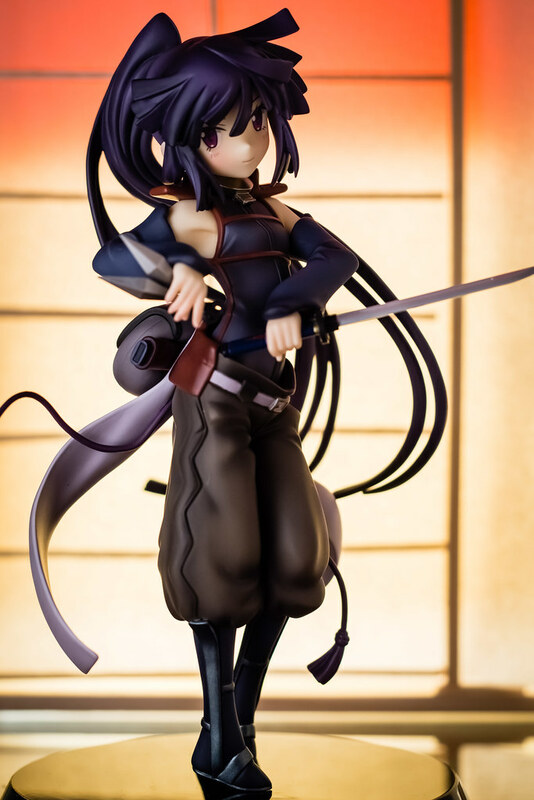 I should have suspected as much given I had liked another work by Mamare Touno, Maoyuu Maou Yuusha. Out of all the shows that follow this premise I have enjoyed Log Horizon the most. One of the reasons is how this time around the world of Elder Tale, the MMO that Shiroe and the rest are trapped in, actually feels like a game. In other shows, like SAO for example, aside from token references to concepts like logging out, hp bars, quests, etc it all really just felt to me more akin to a fantasy show. The way things like skills and such were handled was essentially just the same as using a named attacked in something like a shounen show. 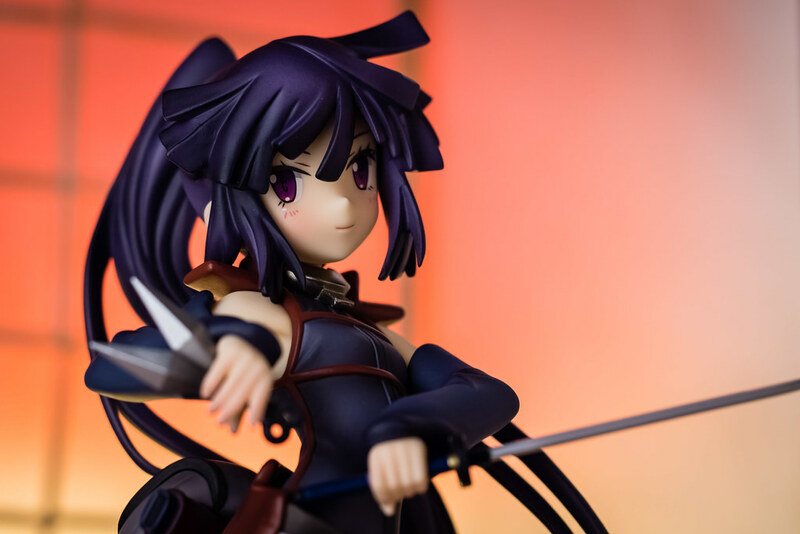 Log Horizon on the other hand? Stats and skills work like one would expect in MMOs, concepts like aggro management, good party composition, and skill cool downs to name a few play a key role in battles. My favorite aspect that is explored is the relationship between the players and the now sentient NPCs, the People of the Land. The very idea of the rules we take for granted when interacting with a game affecting the overall plot is quite engrossing to me. Specially when it leads to characters such as the quirky Princess Lenessia or the ever amusing interactions she has with several of the other characters. Indeed, while I love the way the setting is handled, it is the characters that make me stay and got me hooked. 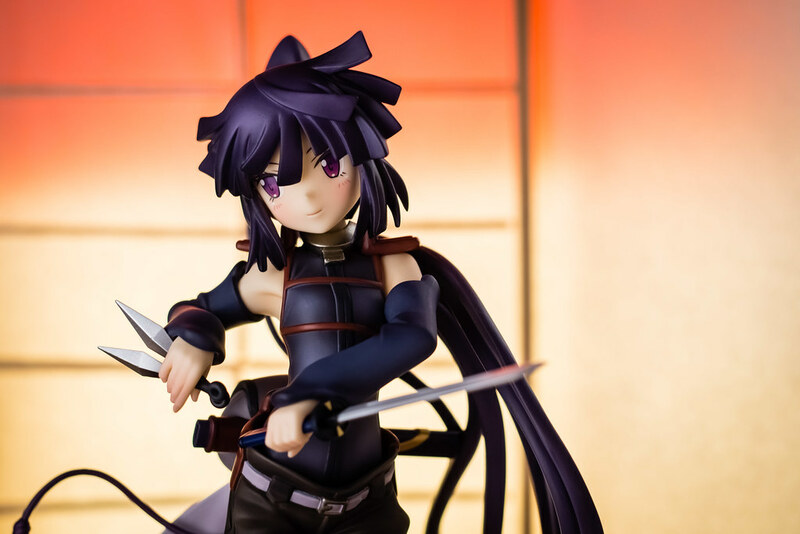 It's probably easy to tell what I will say next, out of all of those characters Akatsuki is my favorite. That's why when I saw this figure I took a gamble and tried Aquamarine for the first time even when I think their prices a tad bit too high. Did that gamble pay off? Well, I would say yes, it paid off quite well for me. Aquamarine's rendition of Akatsuki is spot on. At a glance you can tell it's her, those deep purple eyes, her subdued smiled that reflects her personality perfectly! The locks of her hair match her rather distinct style from the show with no problems. 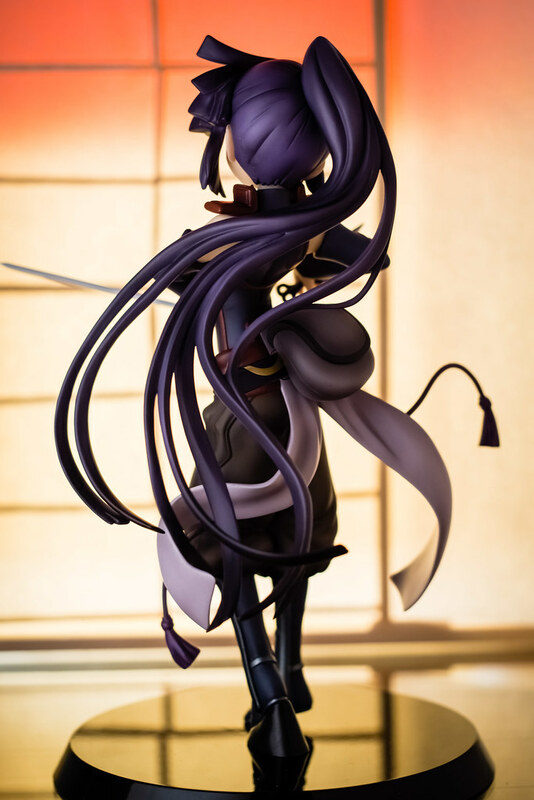 My favorite part of this figure is definitely Akatsuki's hair and in particular, her long ponytail. I have always loved how in the show it was used to display motion so well. 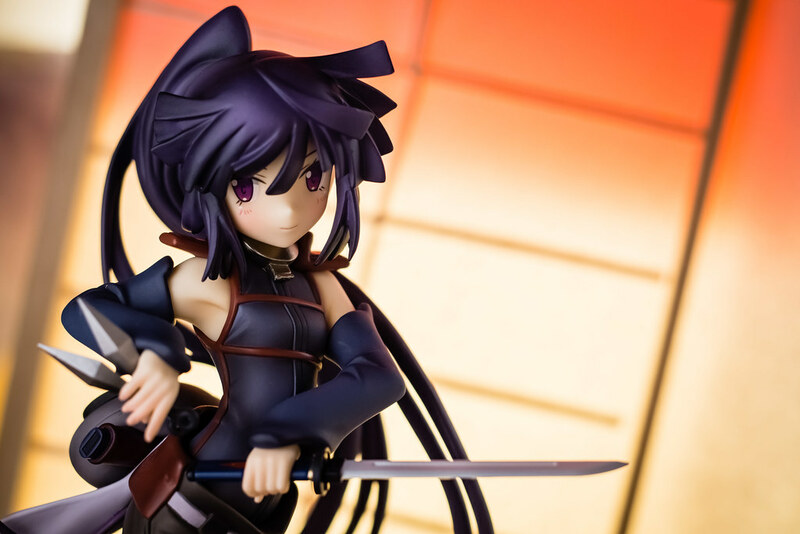 In my eyes it gave Akatsuki a unique sense of smooth movement, something I found perfect for her class and skill set in the game. 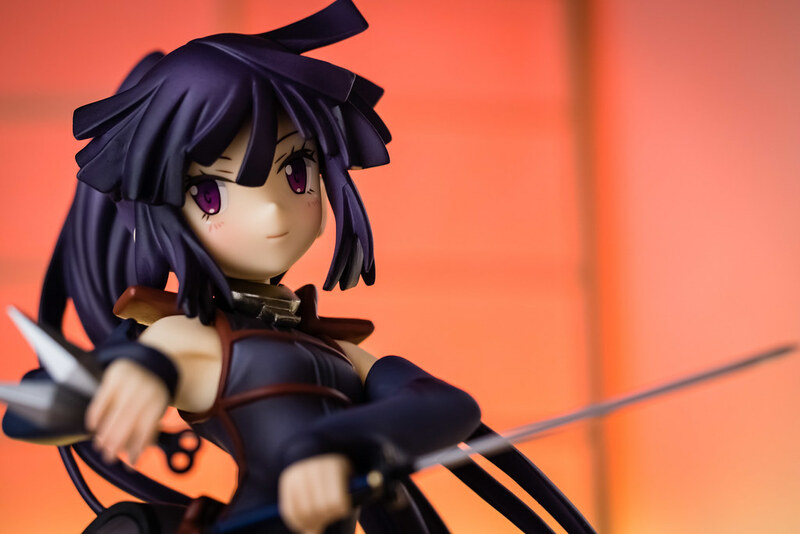 The overall sculpture is great, no particular rough spots on the figure itself. Same goes for the painting, everything looks quite nice with no blemishes to be seen with the naked eye. 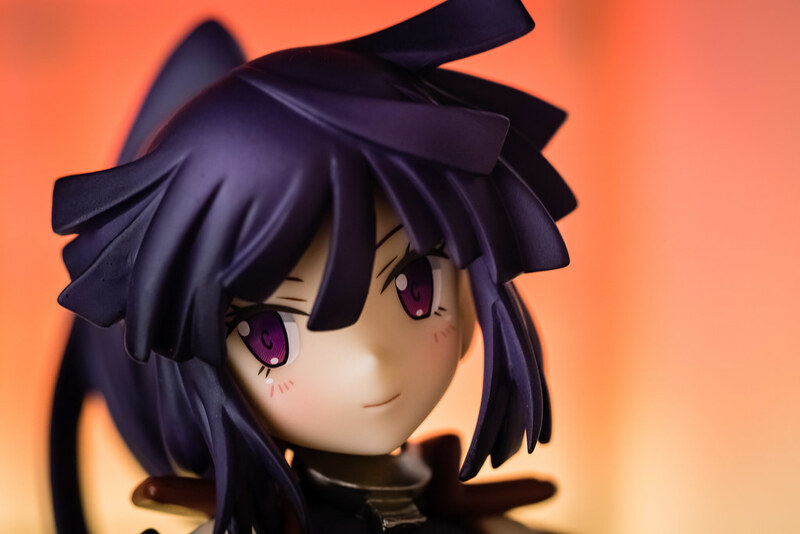 Details such as shading are done well and small touches like Akatsuki's blush were pulled off with no issue. If I have one complaint with the painting it would fall on her weapons. 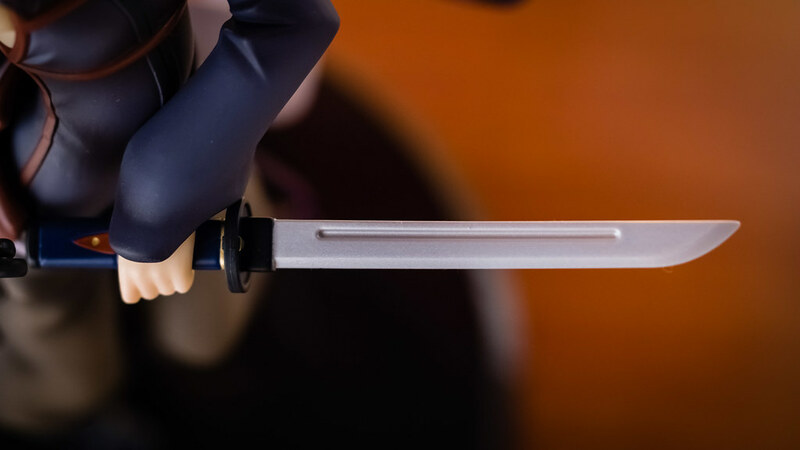 The shade and texture they used for her sword and kunai doesn't give me illusion of a metal blade. When compared to other figures I own I think Aquamarine could have done a bit better. 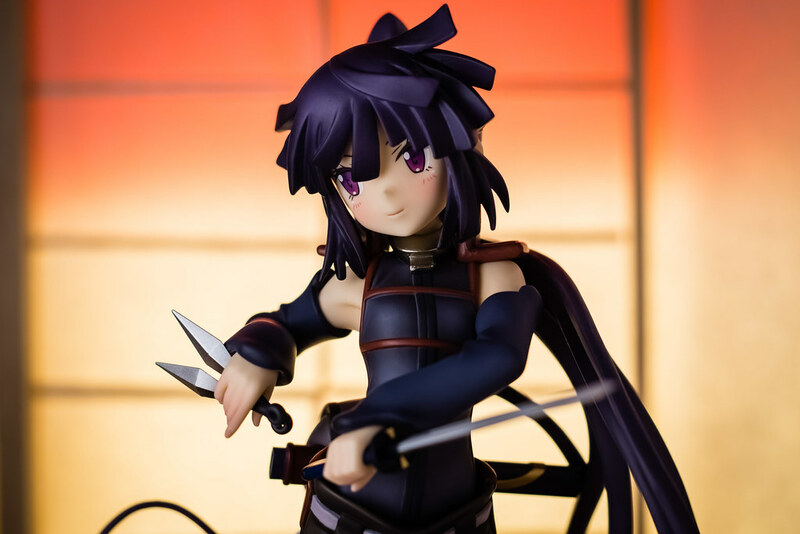 That however, is something I can easily overlook and forgive though because the one thing I truly hate about this figure is her kunai. The kuani are two separate pieces and are held together by a small shallow peg on the handle. 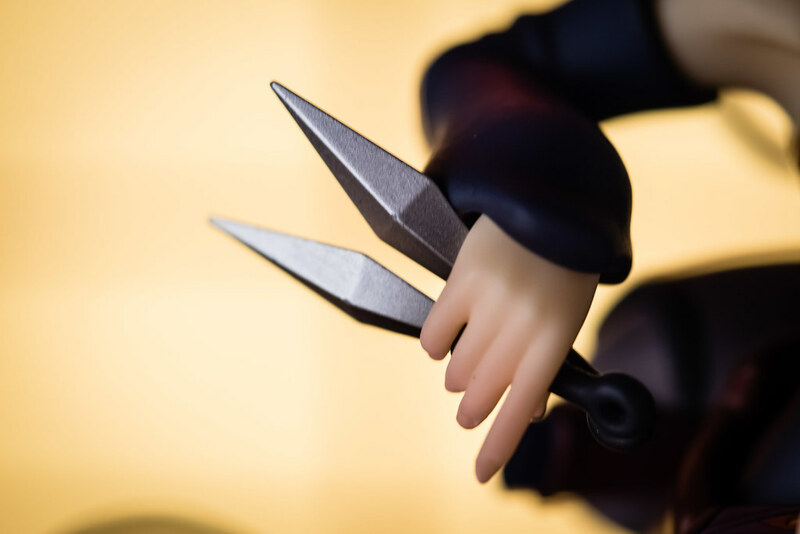 This made it nearly impossible to insert them in Akatsuki's hand as the action of trying to do so would cause the two kunai to separate. The peg is just not enough to hold them together when applying force. It was so frustrating to me that I resorted to gluing the two together. In the end though, I'm very pleased by the work Aquamarine has put out with Akatsuki. 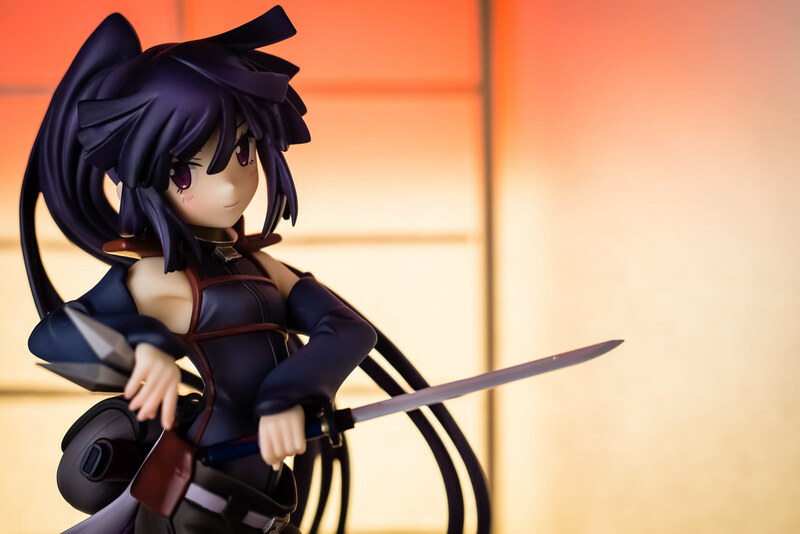 I won't hesitate to buy more figures from them in the future if the right character at the right price shows up. Overall a quite pleasant and positive first experience!